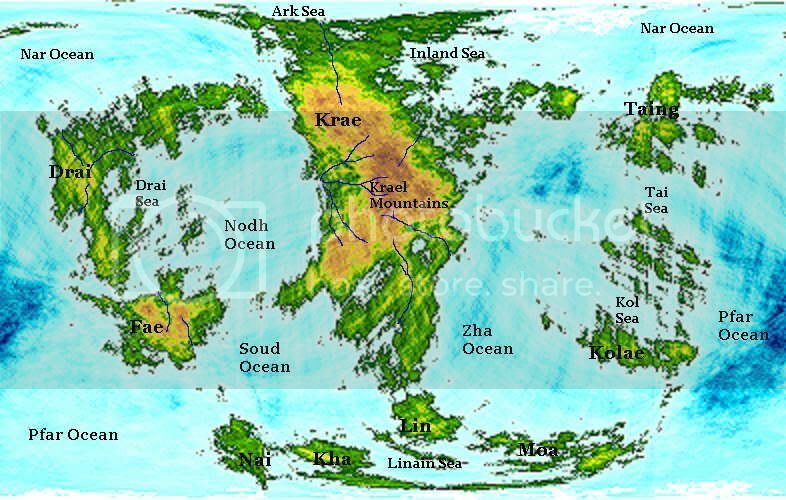 Daistallia Prime's geographic land mass is dominated by one very large continent (Krae) Two mid-sized continents (Drai and Fae), six small continents/large islands (Nai, Kha, Lin, Moa, Kolae, Taing) and several large archipelagos. Krae is a long narrow continent aligned on a north south axis. The cntral area is dominated by a high mountainou region known as the Kraels. The highest peaks are over 15,000 m. The Northern and southern parts are significantly flatter. Drai is relatively flat and has a highly indented coastline. Fae is dominated by interior highlands, which reach lower altitudes, known as the Fraish. The hydrosphere is divided into one large ocean (Pfar), two medium sized oceans (Zha and Nor), and two smaller oceans (Soud and Nodh). There are also several large seas. At the northern polar region is the Ark Sea, to the northeast of Krae is the Inland Sea, and to the south is the Linain Sea. The continent of Drai surrounds the Drai sea. And the subcontinents of Kolae and Taing are separated by the Kol and Tai seas. There are several major biomes found on Daistallia Prime. The most extensive biome is the forests. Forests cover 50% of the Daistallia Prime's land area. Much of the Daistallia Prime's forest area consists of dense triple canopy rainforest. At more northerly latitudes and alpine, this thins out into spase parkland forest and grasslands and tundra.